by Daniel E. Woodhead, Ph. D.
God is completely holy, and He punishes sin (Romans 1:18). Furthermore, mankind is sinful and has broken God’s Laws (Romans 1:19-3:18). There is nothing that mankind can do to earn God’s favor (Romans 3:19-20). The way of salvation is a free gift from God through the atonement of Jesus Christ (Romans 6:23). It is offered to all who would believe on Christ (Romans 1:16-17; 3:22-30; 4:2-8:24). The only people who experience salvation are those who have actually accepted Jesus’ atonement by belief in the Gospel of Jesus. Because of his sin, Hallal was thrown out of his exclusive Heavenly reign, and then was “cut down to the ground”, where he continued his sinful activities as the one who “didst lay low the nations!” We do not exactly when His name was changed from Hallal to Satan, which is a Hebrew word meaning “adversary”. He is God’s adversary. As a result of his Fall, He polluted the Heavenly Tabernacle of God when sin was found in him, and that needed cleansing that is only provided by the blood of Jesus Christ. Then he indwelt a serpent in the Garden of Eden, beguiling our first parents Adam and Eve, causing them to disobey God. This act then caused sin to enter the sphere of time and space, as it was already in Heaven. The result of the Fall in the Garden of Eden was that death entered the pristine earth through Adam and Eve’s sin, and more specifically the Garden of Eden where Jehovah God has placed Adam and his wife. Even though the earth became corrupt as sin entered it and caused death to reign over the creation, the more serious result was spiritual death (Romans 5: 14, 17, 21). All physical matter became a prisoner to the Laws of Entropy. Decay began at the point of the Fall, immediately after eating the forbidden fruit from the Tree of the Knowledge of Good and Evil, and the “eyes of both of them were opened.” This means that Adam and Eve’s awareness expanded, but not to what the Devil had led them to believe it would be. Acting on the prompting of the Devil did not lead to divine enlightenment as he promised it would, but instead it led to a sense of shame. Satan promised them wisdom, which he cannot provide. Only the fear of God can bring wisdom (Proverbs 1:7). The world seeks Satan’s promises, and they always fail to receive them. Disobedience of God’s Word will never bring any benefits, only grief and lack of spiritual blessings. God immediately set up a Redeemer, Himself. The serpent, which allowed itself to be used by Satan and caused the downfall of mankind, is now held responsible for its actions. It is cursed “above all cattle and above every beast of the field”. Following this, the Lord said that the serpent would be destined to “crawl upon thy belly”. This means that it was at one point it stood upright, but there is no mention of any legs. Finally, the Lord states that the serpent would eat “dust” all the days of its life. Since the serpent does not have an actual diet of dust, we see a Hebrew idiomatic phrase “eat dust” used here as used by a conqueror over his enemies. In a contemporary setting we see this in automobile races where the winner states that the loser has “eaten his dust.” The Old Testament uses this term in much the same way (Micah 7: 17; Psalm 72: 9 and Isaiah 49: 23). In theology this verse is called “the Proto-Evangelium” because it is the first appearance of the Gospel. Conversely, it is also the first prophecy the Lord gave us of the Antichrist. Hostility between Satan and women. Hostility between Satan’s seed, the Antichrist, and woman’s seed, who is Christ the Savior. Christ bruising the head of Satan. Satan bruising the heel of Christ. The first provision is that God will “put enmity between thee and the woman”. This state of hostility between Satan and women is persistent, and is brought about because of women’s special redemptive role of bringing the Messiah into the world. The first satanic attack on women is described in Genesis chapter six where demons intermarry with human women in an attempt to stop the coming of the Messiah by corrupting the quality of the human race. A worldwide flood stopped this attempt. In verse 9 of II Thessalonians chapter 2 above, the word “working” is the Greek word energeo, which means, “to energize”. So then the coming of Antichrist will originate by the “energizing” that comes from Satan. This counterfeit Son of the unholy Trinity will be brought about by a counterfeit virgin conception. A time is coming when the events of Genesis chapter six will be repeated, namely that the fallen, anointed Cherub, Satan (in the Latin Hallal is called Lucifer) will impregnate a Roman woman to give birth to Satan’s son. The product of this conception will be a counterfeit “god-man”. The third provision promises a curse, which is: “he shall bruise your head.” The woman’s “seed”, Jesus, gives the bruising to Satan by His death and resurrection (Hebrews 2: 14-18). The word “bruise” implies it is a harmful condition, but not fatal especially since its target is the “head”. Satan is still alive, but will eventually become placed in a terminal condition due to Christ’s finished work. Because of Romans 16: 20 and Revelation 20:10 we know that Satan’s final demise will be in the Lake of Fire. This will be a “crushing” of the head of the serpent, and his demise will be eternal. The fourth provision in Genesis 3: 15 is: “You shall bruise his heel.” Satan will bruise the heel of the Woman’s Seed, and this represents the crucifixion. The bruising of the heel, while painful, is not terminal. The bruising and crushing can be best understood with imagery regarding the method of dispensing of poisonous snakes in Israel. They must crush its head in order to completely eliminate its threat. As the heel of Messiah comes down on the serpent (Satan), the serpent rises up to bite His heel causing pain but not pain leading to an eternal pain (death). As the heel of Messiah continues to descend on Satan even though it has been bitten (the crucifixion), He is not dead so the heel continues down to finally crush the serpent’s head ending in his demise. The fact that the Messiah had to come is well attested to in Scripture which starts with this foundational verse, Genesis 3: 15. 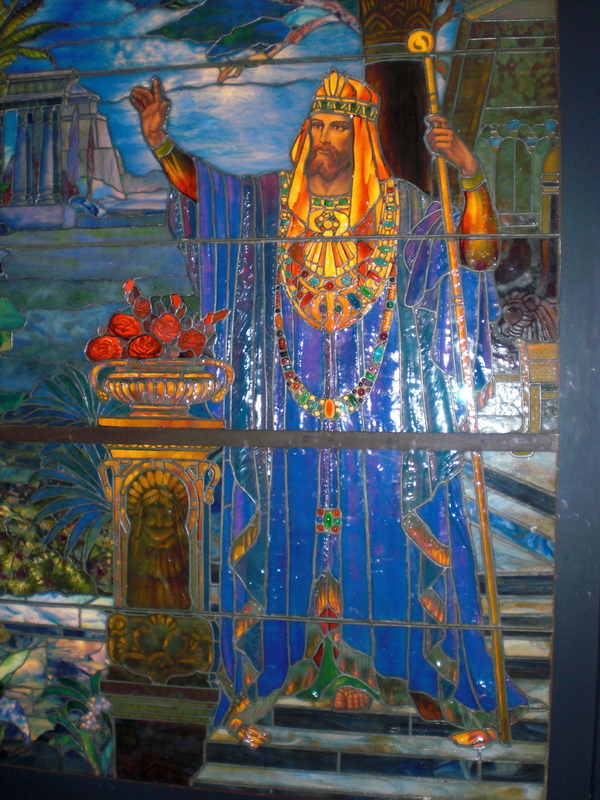 One unique aspect of the Scriptures of Christianity is the prophecies and validated fulfillment at later times in the long chronology of the Bible’s story. These alone attest to the Scripture’s validity. Christ, after He was risen, explained many of the prophecies in the Bible and the fact that He had to die in order to accomplish the task He was to sent to do (Luke 24: 25-27). Jesus accused the Pharisees of not knowing who He was. In fact, He said that Moses knew He was coming and wrote of Him. 25 Then he said unto them, O fools, and slow of heart to believe all that the prophets have spoken: 26 ought not Christ to have suffered these things, and to enter into his glory? 27 And beginning at Moses and all the prophets, he expounded unto them in all the scriptures the things concerning himself (KJV). He would be born in Bethlehem in the region of Ephrathah. Introduced in Micah 5: 2 and fulfilled in Matthew 2: 1-5. Introduced in Psalm 2: 7 and fulfilled in John 3: 16-17. Genesis 49: 10 and fulfilled in Hebrews 7: 14. Introduced in Isaiah 7: 14 and fulfilled in Matthew 1: 18-22. Introduced in Deuteronomy 18: 15 and fulfilled in John 7: 15-17. Introduced in Zechariah 9: 9 and fulfilled in John 12: 12-15. Introduced In Micah 5: 1 and fulfilled in Mark 15: 19. Introduced in Isaiah 53: 7 and fulfilled in Matthew 27: 12-14. Introduced in Psalm 41: 9 and fulfilled in Mark 14: 17-20. Introduced in Psalm 22: 16 and fulfilled in John 19: 17-18. Introduced in Psalm 22: 18 and fulfilled in John 19: 23-24. Introduced in Psalm 69: 21 and fulfilled in John 19: 28-29. Introduced in Exodus 12: 46 and fulfilled in John 19: 31-36. Introduced in Isaiah 53: 5-6 and fulfilled in I Peter 2: 24-25. Introduced in Psalm 16: 10 and fulfilled in Luke 24: 1-7 and 47. The Jews were given a lot of evidence for the coming one who would take away the sins of the world. We see Simeon and Anna waiting in anticipation at the Temple for the baby Messiah to be brought there for His circumcision on the eighth day of His life. 25 And behold, there was a man in Jerusalem, whose name was Simeon; and the same man was just and devout, waiting for the consolation of Israel: and the Holy Ghost was upon him. 26 And it was revealed unto him by the Holy Ghost, that he should not see death, before he had seen the Lord’s Christ. 27 And he came by the Spirit into the temple: and when the parents brought in the child Jesus, to do for him after the custom of the law, 28 then took he him up in his arms, and blessed God, and said, 29 Lord, now lettest thou thy servant depart In peace, according to thy word: 30 For mine eyes have seen thy salvation.31 Which thou hast prepared before the face of all people; 32 A light to lighten the Gentiles and the glory of thy people Israel. 33 And Joseph and his mother marvelled at those things which were spoken of him. 34 And Simeon blessed them, and said unto Mary his mother, Behold, this child is set for the fall and rising again of many in Israel; and for a sign which shall be spoken against; 35 (yea, a sword shall pierce through thy own soul also,) that the thoughts of many hearts may be revealed. 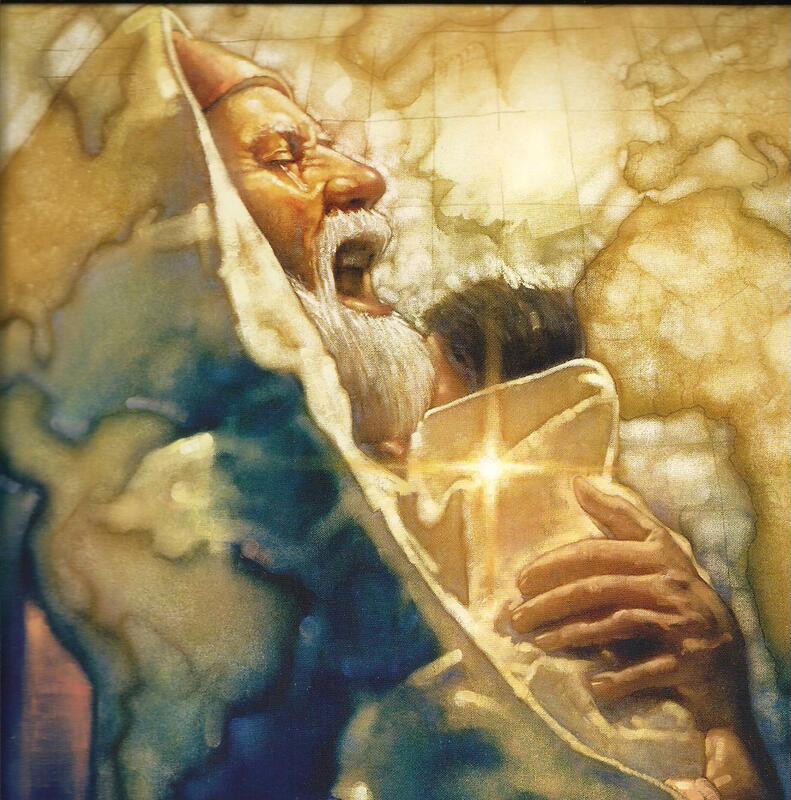 The observant Jews of the Old Testament knew that the Messiah was going to arrive to provide salvation as Simeon cried had out, “For mine eyes have seen thy salvation.“ It is also quite clear it is the sacrifice of Jesus that provides our salvation from sin. Even though many knew He was coming (and would in the future be sacrificed), how was salvation guaranteed to the faithful in the Old Testament before Jesus’ sacrifice? First it is important to consider what the Bible teaches on the place of the dead. The Hebrew name for the place of the dead is Sheol, and the Greek word is Hades. Frequently our English translations will simply states these words as “Hell”. This is not accurate. The Old Testament declares in many places that people, both the faithful and unfaithful, went to Sheol when they died. 8Then Abraham gave up the ghost, and died in a good old age, an old man, and full [of years]; and was gathered to his people (KJV). So, we see in the first book of the Bible that after people die physically, they are “gathered unto their people.” They are joining the company of people who preceded them in death, and are consciously aware of them. Due to his righteousness, the destination of Abraham in the good side of Sheol is described in the Bible: “And he believed in Jehovah; and he reckoned it to him for righteousness” (Genesis 15:6). The following examples discuss this. In this Psalm, the author Asaph expressed a real faith in immortality. Even upon his death he saw himself as being conscious and with God. Here Solomon expresses the truth that the body returns to the earth to decay, and finally become dust, but the spirit goes to be with God our creator. The New Testament expresses this same concept in at least four verses. They are found in: II Corinthians 5:1-8; Luke 23:43; John 14:3; Philippians 1:22-23. In this passage, the soul of the king of Babylon enters into “Sheol”, and into a particular section of Hell, where all the souls that preceded him in Hell suddenly rise in astonishment as they see this one also entering the domains of Hell. They are able to ask questions and carry on a conversation. It should not be missed that these dead ones are portrayed as being conscious. Here, in the “bad side” of Sheol, there is punishment for the king of Babylon. So, there is clearly a good side and a bad side to the place of the dead. At the time of Jesus telling this story, He was essentially referring to Old Testament people. Abraham is in a location within “Hades” Jesus calls “Abraham’s bosom”. He also made reference to it as “Paradise” to the thief on the cross that expressed belief in Jesus as his savior (Luke 23:43). The rich man is in a place of torment also in Hades. There are then multiple compartments to Sheol or Hades. The Old Testament saints had to wait until Jesus was sacrificed in order to go to Heaven. When He died, He went to the “good side” of Hades to release them, and took them to Heaven. Most of the Old Testament verses using the word “Heaven” refer to the atmospheric Heaven, not the place of the dead. 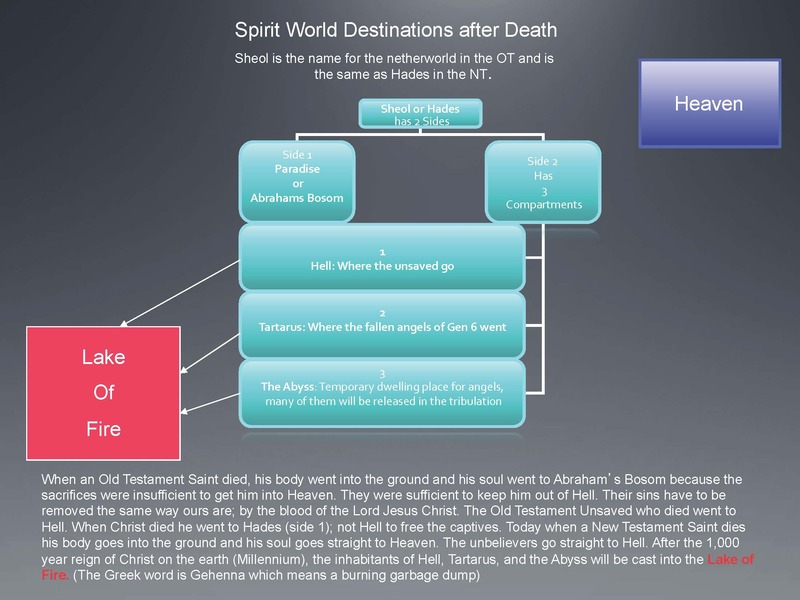 The New Testament does refer to “Heaven” as a place where the dead go as well as “Hell”. “Heaven” in the New Testament is the equalivant of “Paradise” in the Old Testament place of the dead. The folks who die in the New Testament era either go to “Hell”, the place for the unsaved, or “Heaven”, the place for the saved. After Jesus was complete with His resurrection body, the implication was that He descended again to Hades to gather the Old Testament saints and transport them from Hades to Heaven. The Old Testament saints were “captives” in the sense that they were not permitted to go to the presence of the Lord before He died on the Cross. Now, however, Christ led their souls in a great procession as a conquering general, to present them to the Father in Heaven as fully redeemed saints, awaiting their own resurrection from the dead. Peter says that Christ died, and preached “to the spirits in prison”. The ones he mentions were certain ones who were disobedient at the time of the Flood of Noah. However, it also seems clear that He had a great message for the Old Testament saints about their coming elevation to Heaven. However, the unrighteous souls were destined to remain in the Place of Torment in Hades until they face the Judge at the Great White Throne, and the Lake of Fire.